Dishboy Scott and I got to work in my kitchen after picking a large bucket of wild blackberries. There we carefully weighed and split our precious fruit and set to work making pies for our families. Scott decided on a more traditional blackberry peach, while I thought something new might be fun. Being used to such looks, I proceeded anyway. I let the pie cool and took it up to my parents’ place where everyone bravely took a very small piece. They thought the idea was bizarre as well. However, a small piece turned into multiple pieces and even my dessert avoiding dad went back for seconds and thirds. In short, this pie was AMAZING! The grapes stayed plump and the pie was so perfect and juicy. 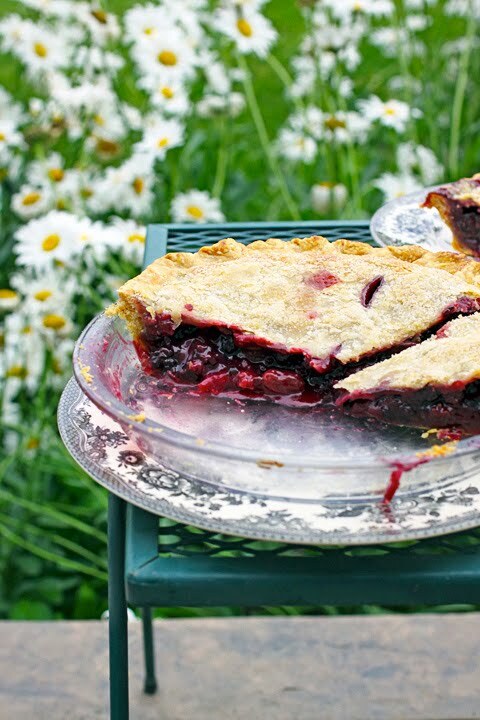 They also gently added sweetness to the blackberry flavor without taking anything away from the stars of the pie. And poor Dishboy, he never did get a piece, but I’ll be making this pie again soon. I might offer him a sliver if he’s lucky. It sounds a little strange to purchase a can of green grapes, but it’s the syrup you’re after. It makes the pie juicy and flavorful. 1. Move the oven rack to the lower quarter of the oven and preheat to 400 degrees. In a small bowl mix together the egg white and water, set aside. 2. Mix together the sugar, flour and salt in a small bowl and set aside. Do not skip this step or you’ll have starch lumps. 3. Place the grapes with the syrup in a large bowl. Add the blackberries, white vinegar, almond extract, vanilla extract and sugar mixture. Toss together and set aside. 4. Place a dough in a 9” pie dish. Brush with egg wash. Pour in the fruit and dot with butter. Top with the other dough and crimp and seal pie. Brush the top with egg white, sprinkle with sugar and cut vents in the top. 5. Bake pie for 30 minute. Reduce heat to 375 degrees, cover with a pie shield and bake 20 to 30 minutes or until pie is bubbly and bottom crust is golden. Cool for several hours before serving. Certain people should learn not to question you. I certainly never will! Looks fantastic. The pie looks wonderful. Sounds wonderful though I'm with dishboy about the grapes. Please don't try Durian. How silly of him to doubt you! This sounds so different from the usual pies. Love your outside-the-box thinkin'! That pie look so good. I really like how your pie turned out. I 've never had that combination before but, I am sure to make it. This looks wonderful! Grapes and blueberries sound great to me! I'm glad that your pie turned out so well...I would have been eager to try it. I don't know if there is a better way to spend the day than baking pies for those you love. Blackberry and green grapes?! Whoa...never thought of that combo....and I probably haven't heard of anyone making it either - I bet it tastes wonderful! I have to say that you do come up with some interesting ideas Laura and you've never steered us wrong. Sorry Scott But Laura's imagination must have tastebuds! Good for you for pressing forward even when others thought it was weird or gross. You showed them! What an interesting take on pie Laura. You know what though? I don't think I've ever seen grapes in a can over here. I'll take your word for it, the pie does sound (and look) delicious. Interesting.... I imagine it was absolutely delicious. You are so adventurous in your baking, and always kicking things up a notch, Laura! That pie looks mouth watering! Im a new follower. I would like to feature you on my blog with a recipe. Would you be interested? This recipe looks so yummy.